mall watt amps are now more popular than ever. Amateur guitarists love them because they’re portable and they’re not crazy loud, but loud enough to maybe jam with a few friends. Professionals love them because they’re portable and are sometimes preferable in a studio situation. The award winning HT5 series from Blackstar is also popular because it has found a sweetspot for combining quality, features and size. The HT-5RH is a 5 watt all tube head with stereo digital reverb. 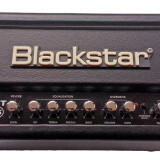 Blackstar also offer a HT5 combo and similar models in a 1 watt version (the HT1RH and HT1R). Of course, the advantage of an amp head is that you have a compact and portable unit, able to easily be plugged into any cabinet you like. The benefit of a combo is that it’s all in one unit. A little research will tell you that the features on the HT-5RH are almost unparalleled in this price range. It’s extremely difficult to find many all tube models that boast reverb, effects loop, foot switchable channels and emulated output. For those seeking that combination of features, the HT-5RH is a very strong contender. Another way to look at the popularity of the HT5 is that it doesn’t offer on board effects. Some see this as preferable, as they may have their own effects and prefer the amp to be simple. There are two foot switchable channels, clean and overdrive. The switch comes with the amp and it’s a solid steel construction box…if a little small. The clean channel has a volume and single tone control. At first, a single tone control seems woefully inadequate, however it is far better than what you’d expect. Turning left softens the tone, increasing bass and suppressing top end frequencies. Turning right brightens the tone. It would be great to have more options, but I’ll be honest, I dialed in a couple of really nice tones without any problem. Even with the tone dialled all the way either extreme, the sound was totally usable. The overdrive channel is far more flexible, with the standard bass, middle and treble controls, volume and gain, as well as Blackstar’s proprietary Infinite Shape Feature (ISF). The ISF feature doesn’t apply to the clean channel. The idea behind ISF is that on top of the standard tone controls, this allows you to give the amp the classic sound characteristics of either American or British amps. For America, think Mesa Boogie…for Britain, think Marshall. It’s actually a cool feature. I’m a bit of a Marshall fan, so I had it all the way to British (which is “10” on the dial) for a lot of the time I was playing. As I dialled back toward “1” (which is the American direction according to the manual) the tone gets hotter and has more bite. I really like the feature, it’s not a gimmick, it has practical use. It retains the bass, mid and treble settings, and overlays the characteristics of stereotypical British or American tone. The digital reverb is nice, I can’t really fault it. It doesn’t sound artificial and if you prefer your reverb to come from a pedal or effects unit, then just leave it on “0”. So how does it sound? I absolutely love the tone. Heading in to this review, I had an impression that this range from Blackstar purely had its strengths in the overdrive channel (and it is strong in that department). But the clean channel really impressed me. I tested through both a Blackstar HT112 cab and an Orange 1×12 cab. I’d like to hear from existing HT-5RH owners about to hear what cabs they’ve paired it with and what the results were. So if that’s you, please comment below. It was a lot warmer than I expected, and had a nice compression-type tone from the 12AX7 tube. So clean blues and jazz tones are better than I’d expected. As I’ve mentioned, the single tone control is odd at first, because you want to adjust more tone controls. However, it wasn’t long before I was kind of thankful that I only had one dial, it’s simple, and the single tone dial gave me really nice clean tones. Switching on the overdrive you get access to more tone controls and the interesting ISF feature. You also get to feel just how loud 5 watts can be. Some of you may not know that 5 watts of tube amplification is far far louder than 5 watts of solid state amplification. A 5 watt tube amp is closer to a 40 watt solid state amp. The HT-5RH is probably loud enough to compete with a drummer, depending on the cab you’re using and how hard the drummer plays! The tone of the overdrive is so impressive for an amp of this size and cost. With ISF, it’s easy to quickly change the shape of the tone from warm and rounded to sharp and biting. I was also able to get very light crunch tones by dialing the gain right down and keeping volume up. There’s a lot of accessible tone from these tubes, even at very low volumes. The HT-5RH has no on board effects, unlike a LOT of amps these days. There are no presets or programmable banks of tones, and whilst I like any feature that expands your available tones, I also appreciate simplicity. It just delivers a really solid clean and overdrive channel. It makes me feel as though you’re paying for the tone, and not the bells and whistles. For guitarists who already own a lot of effects, this sort of simple tone machine can be more appealing than an effect-laden amp. That being said, the other features of this amp are far from unimpressive. If you look across the image of the rear of the amp, you can see a LOT going on for an amp of this size and price. Effects loop – to have more control on adding your effects after the pre-amp stage. This feature is extremely rare on an amp this size and price. Emulated output/headphones – this allows you to plug in headphones or send the signal to a PA and choose between emulating a 1×12 cabinet or 4×12 stack. A really interesting feature & whilst I didn’t test with a PA, I did test this with headphones and there is a distinct difference between the two. Neither is better, they just suit different applications. Plenty of great albums have been recorded using low powered amps. It’s an impressive list of practical features and heavily favours the home guitarist with things like MP3 line in as well as headphone output. Yet another seriously impressive aspect of the HT5 series is the build quality. It has classic looks & the construction is sturdy and classy. From the solid leather handle to the corner caps, to the chrome dials…its solid and classic. This isn’t an overly heavy amp at 7.5kg (16.5lb), which helps with its portability. One minor gripe I had was that it’s hard to see what setting the dials are on, because the black background of the control area has a gloss finish and the numbers are white. The reflection means you can’t read the numbers unless you’re at a particular angle. It may have been the low light in my practice room, but sometimes I found that I couldn’t really tell what setting I was on at first glance. I actually had to lean down and get a closer look. It’s not major, and was probably more noticeable because I was making so many changes during my review.